Today’s horror games push boundaries in all aspects of the term. Games like Outlast, Resident Evil, and others aren’t afraid to show shocking, gory, and even controversial elements. 2DARK attempts to straddle this line with an edgy concept that brings some unique elements into play. Does it land on the right side, or does this horror title get a little too dark? Time to find out. The premise of 2DARK is a strong one. You play an ex detective who has had more than his fair share of tragedy befall him. He takes it upon himself to try and get to the bottom of a mystery in which children have gone missing at an alarming rate. It’s refreshing to see horror games try new things, but even as someone who isn’t easily offended, there’s always going to be a line that horror shouldn’t cross. It’s the difference between the Saw franchise and the Human Centipede series that illustrates my point. Your journey takes you to plenty of unique and eerie settings, but it’s in the process of discovering the master plan behind everything that 2DARK started to make feel disturbed, and not in the good way. I’m a huge horror fan, and I don’t mind psychotic enemies or twisted personalities, but the treatment of the children in 2DARK, in my opinion, crosses some lines that have no benefit to the story or the world. Blatant abuse, extremely uncomfortable dialogue, and maiming of young kids only begins to scratch the surface of the things 2DARK will allow in its setting and story. It’s a shame too, because the characters in this game do seem like they have some interesting backstory and the collectible pieces of lore are all well done with great artistic style and grittiness. It’s all unfortunately soured, though, by the moments of unnecessary violence and overly controversial dialogue on the part of the enemies. The whole experience left me feeling unsettled. Instead of being terrified by the premise and storytelling, I was instead mildly disgusted. I had to force myself to go back into the world, partially because of the story’s approach to horror, and as a result of gameplay issues that we’ll discuss next. 2DARK does some pretty unique things with its gameplay. The game employs an isometric perspective and focuses heavily on stealth. To that end, you can walk and see the sound waves around you that indicate how much noise you’re making. There’s no sprint button, but you can tip-toe to reduce the noise you make. The game does have combat, but beyond fighting off some rats, it’s not advisable. The inventory menu is always present, and while quick slots are available for each of your hands, the entire setup is clunky. You’re forced to use the d-pad when navigating the menu, and the quick slots don’t do much to make things easier as you have to equip items separately in each hand. On the one hand, it causes a very real sense of panic if you have to quickly pull out a weapon, but to that same point, it’s annoying to get killed because you were wrestling with the inventory. 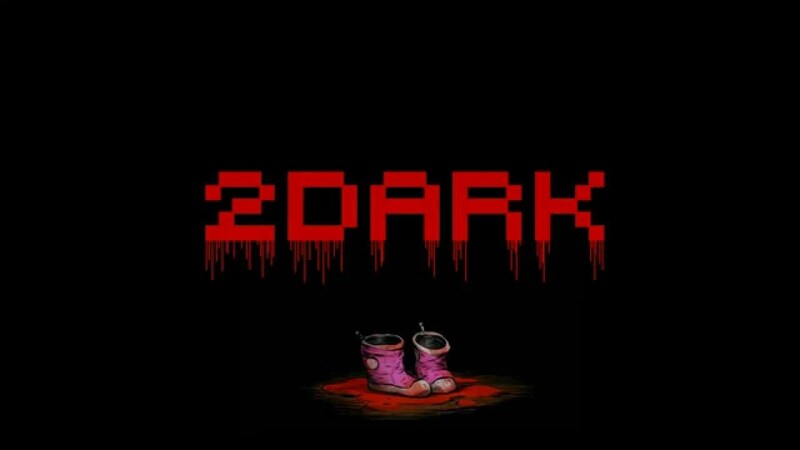 The gameplay loop of 2DARK is really heavily based on trial and error. You can save whenever you like with a cool smoking mechanic, so that alleviates some, but not all of the frustration. Beyond enemy types that can take more bullets that a tank, the melee combat is unresponsive and practically useless in any combat situation. Combine this with environmental traps and pits, and you’ll die a lot. I’m not against a difficult game, but 2DARK’s mechanics work against you enough that you’ll die a lot of times from trial and error, and also plenty of deaths from failure on the game’s part. Frustration is impossible to avoid here. The goal of each level is to find and rescue the kids. In yet another design choice that makes me wince, the only way to get the kids to follow you quickly, is to throw candy at them. Yep, you lure kids to safety with candy. It’s just, for lack of a better word, odd. You can also just pick the kids up and carry them without their permission. The longer you keep them in the situation, the more emotional they get, which can lead to plenty of situations where the cries of a child gets you spotted and quickly sent to the game over screen. Again, an interesting mechanic, but it just ends up piling on more frustration as time goes on. The game has a wide and open level design with very little in the way of guidance. Again, awesome decision for player freedom, but when game overs happen more often than finding a single kid, it starts to get old. While 2DARK has some cool mechanics, the gameplay sadly doesn’t come together in a cohesive, and most importantly, fun way. I like the art style for 2DARK. Someone online compared it to the style of Super Mario RPG, which I suppose is a fair comparison in terms of the character models. They have a kind of early 3D blocky look to them, but it pairs well with the detailed environments. What voice work is there is fine, and the rest is delivered through text. Music and sound are also fine, portraying a sense of dread and horror. The game over screen is especially jarring when it happens unexpectedly. It’s a retro presentation, but it works for the purposes of the game. It’s really unfortunate, because I wanted to like 2DARK. I think it has some really great parts, and some good horror segments. It just goes too far with some of its concepts and mechanics, to the point where it’s off putting instead of being scary. If you really want to give this one a shot, wait for a deep sale. It’s definitely not for everyone.